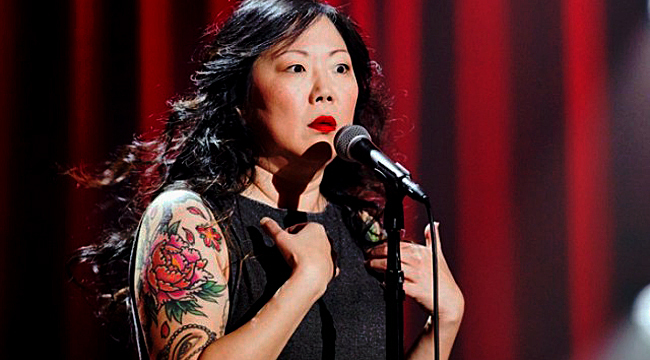 This fall, three-time Grammy and Emmy nominee, comedian Margaret Cho is embarking on The psyCHO Tour this fall. The show will include tributes to her “father in comedy,” Robin Williams and her “mother in comedy,” Joan Rivers. Cho was very close to both legends. She talked about the tour, comedy and politics, calling from her Los Angeles home. Talk a little about the inspiration for the upcoming tour. You’re angry, aren’t you? Well, I think that anger is the appropriate response to everything that’s going on. There’s police brutality and racism. The focus is the rage that I feel about the sexual abuse of women by everyone from Jian Ghomeshi to Bill Cosby to ISIS. We’re seeing a very hostile world when it comes to women and girls. It’s a way to answer that. It’s also a way to cope. Comedy is a way to cope. You’ve said that when men go off on something they are “passionate” and “driven” and when women go off on something they are “hysterical” and “crazy.” Do you think those cultural stereotypes have started to change or are they still entrenched? I think they’re still as entrenched as ever. We haven’t shifted in the way that we think about women and how they talk about society and their commentary on society. I want to throw my hat into the ring. This is my take on it. If we end up with a female president, will that help? I hope so. That would be cool. Hillary’s already been president for eight years. I’ve known her for a long time. I visited the White House during the Clinton Administration. I’m definitely a Hilary supporter. I have endorsed Bernie Sanders. I wish they would run together. I think that would be great, but I think he has a real handle on the way we can solve a lot of issues. It’s an economic struggle. It’s not all racism. It’s not all sexism. That means taxing the super rich and taxing the churches. That really needs to happen. I think it’s really important. Do you have a take on the upcoming election? It’s crazy. It’s like when Joaquin Phoenix wanted to become a rapper and did all those weird things and then called it a mockumentary. I feel like at any moment, Ashton Kutcher is going to come out and tell us that we’ve been punked. I feel like it’s part of a reality show, the presidential version. It’s so crazy. It’s Trump Gone Wild. It’s GOP Gone Wild. What’s your take on Caitlyn Jenner? I love her. I’m so grateful to her. I’m friends with [actress] Candis Cayne. I think this is great. I think it’s an important step for American society to understand gender and transgender. The climate has changed. Before you would see tabloids with photos of Bruce Jenner wearing fingernail polish. Now, it’s shifted. She’s getting an ESPN award and the Arthur Ashe world. She’s on the cover of Vanity Fair. So you don’t find the reality show exploitative at all? No. She has some heavy hitters in regards to transpolitics and all of her visits to these places that I frequent all the time, LGBT centers in L.A. She’s around all these trans kids. The show is beyond reality. It adds a great amount of dignity and gravity to reality television. I’m proud of E and Caitlyn and all these things that are happening. And what about the situation in the Middle East? There’s many different issues and now Syria is much more in the forefront of everything. I don’t understand why Saudi Arabia or any of these countries haven’t opened their doors to Syrian refuges. I’m proud of Germany and Switzerland. Neil Finn from Crowded House has a single out. It’s called “Help is Coming.” It’s a wonderful song. There are different people rushing to the aid. I hope to see more American involvement. I think the Pope has more room in the Vatican. I think he could house a couple of families. I think he has at least one extra bedroom. Your mother has been a part of your routine since the beginning. Talk about the way in which you’ve found humor by representing or misrepresenting her. She’s really funny. She loves to be the center of attention. She comes to the shows and is on the road now and then, a bit less now because she’s older. Before, she would stand by the bathroom and thank people for coming. She’s like a Walmart greeter. I’m proud to bring her along. Can she really play golf? Yes. She’s a great golfer. She’s a tremendous flamenco guitarist. That’s very difficult. She’s a great singer. It’s where I get my pipes from. She’s a very talented woman. Do Asians ever take offense at your imitation? No. they know it’s real. It’s her accent. I can’t imagine anyone taking offense. If anything, it would be offensive if I didn’t do her accent. Your career started back in the ‘90s. Plenty of comics have come and gone since then. What’s the key to your longevity? I love it. I love performing. Comedy has a great impact on my social life. A lot of my friends are comedians and also musicians. My career was never a means to get somewhere else. I wasn’t a comic just so that I could be an actor. I always wanted to be a comic. Standup comedy is my passion and will always be.